With Wisconsin Gov. Scott Walker poised to run for the Republican presidential nomination next year, and performing well in early polls, one aspect of his resume is drawing closer attention: his lack of a college degree. As we first wrote back in May 2014, the last person to win the White House without having a college degree was Harry Truman, who studied briefly at a local business college and a law school but didn’t graduate from either. Of course, Truman was the incumbent in 1948 when he beat University of Michigan and Columbia Law grad Thomas Dewey, having succeeded Harvard man Franklin Roosevelt more than three years earlier. Barry Goldwater in 1964 was the most recent major-party nominee to have not graduated from college: He attended the University of Arizona for one year before leaving in 1929 to work in his family’s department-store business. Al Smith, the unsuccessful Democratic nominee in 1928, was the last major-party nominee to never attend college at all (or high school, for that matter). But since the election of George H.W. Bush (Yale ’48) in 1988, every president has had an undergraduate or graduate degree, or both, from an Ivy League school. The 2012 election, in fact, was an all-Harvard affair, pitting Barack Obama (J.D., class of 1991, following his bachelor’s degree from Columbia) against Mitt Romney (J.D./MBA, class of 1975, with his bachelor’s from Brigham Young University). For much of this country’s history, it wasn’t unusual for presidents and presidential candidates to have not attended college. College, after all, was largely a preserve of the elite until well into the 20th century: In 1910, according to the Digest of Education Statistics, just 2.7% of Americans ages 25 and older had attained a bachelor’s degree or higher, a figure that had zoomed all the way up to 6.2% by 1950. 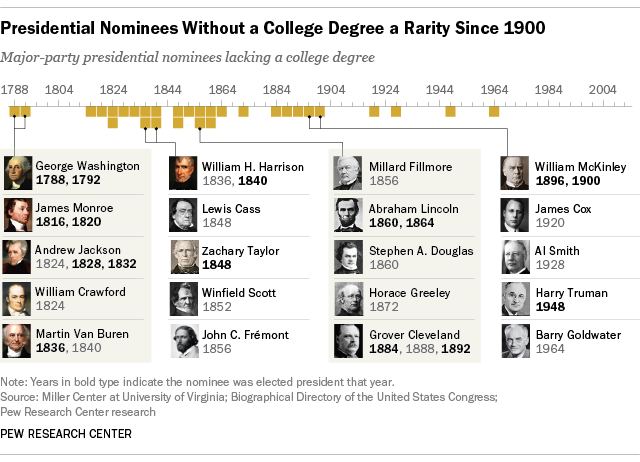 Eleven of the 24 men who served as president between 1789 and 1901 weren’t college graduates (though three of those attended some college without earning a degree). In the elections of 1836, 1840, 1848 and 1860, two non-graduates faced each other; in the multi-cornered races of 1824 and 1856, two of the losing candidates were degree-less. And in 1864 neither Abraham Lincoln nor his running mate, Andrew Johnson, had gone to college.